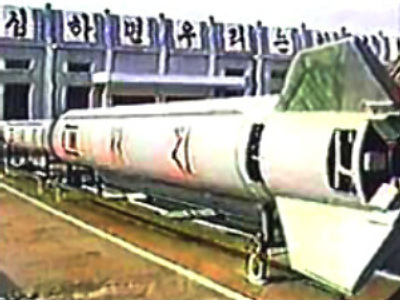 Tuesday’s engine test raises new concern over Pyongyang’s missile programme. South Korean sources said satellite images showed the blackened ground after the test, suggesting the engine was for a long-range missile, most likely the Taepodong-2 ballistic missile. It has an estimated range of more then 6,000km. It may also have been an improved version of the rocket that can fire a missile up to 10,000km, South Korea’s Chosun Ilbo newspaper said, quoting government sources. The new North Korean missile site made the headlines last week after Joseph S. Bermudez, Jr., senior analyst with Jane's Information Group, and Tim Brown from a private satellite imagery analysis company, unveiled satellite images showing the facility. According to Bermudez, the site has been in construction for eight years and its primary purpose is testing long-range missiles. He said the launch pad has been operational since 2005, although Pike added it lacks several crucial elements, including any kind of optical or radar tracking systems. U.S. intelligence has been aware of the North Korean site for several years, according to a U.S. counter proliferation official, who spoke to the Associated Press agency on condition of anonymity. This follows the failure of North Korea’s denuclearisation plan. On August 26 Pyongyang announced it stopped the dismantling of its nuclear facilities citing Washington’s refusal to drop the reclusive communist state from the list of nations that sponsor terrorism. The U.S. insisted on checking the North Korean nuclear file first, a move the Asian country called a violation of agreements. Meanwhile, there are fears that North Korean leader Kim Jong-il may soon die after he failed to appear at the recent celebration of the 60th anniversary of the founding of the People's Republic. With no named successor, the country may fall into a fierce power struggle in case of Kim’s death. The media in South Korea reported he may have suffered a stroke.